Located in the heart of trendy Williamsburg, Mable's Smokehouse does what might seem impossible: It oozes southern charm and hospitality, it affords its patrons plenty of space and just feels legitimate. And that's before you even order. Stepping up to the counter, the focused menu is behind the register and easy to decipher. The friendly staff (these people MUST have been imported from nicer lands!) is ready to answer your questions with a genuine smile, put your order through, and give you your very own state on a stick (I got Alabama) so that they can find you once the order is ready. Plenty of food for two people is the deluxe platter ($24.95), which gives you a choice of three meats and three sides, slaw and pickles. Feel free to double up on anything. Mac n' cheese, borracho beans, all day green beans. As with southern cuisine anywhere, it's a good idea to load up on fixin's. There is a list of nine items at this point, which gives you plenty of variety when you come back in later trips. As for the meat, there are four options to choose from, and while all were good, I cannot help but steer you towards the two that can most easily take advantage of the absolutely wonderful barbecue sauce. The pulled pork (above) is tasty and fresh, but my favorite of the night was the beef brisket (below), which is served in an amazingly ample portion and just screams for you to dump all the spicy sauce on it. It basically melts in your mouth, with a slightly crispy burnt skin. As this is an Oklahoma-style barbecue joint, it was impossible to not include the Schwab's Oklahoma hot link (below), something I had never tried. The link was certainly hot, but somehow seemed out of place with the rest of the food. On a future visit if I choose this, I might try to build my sides around it with the help of suggestions. 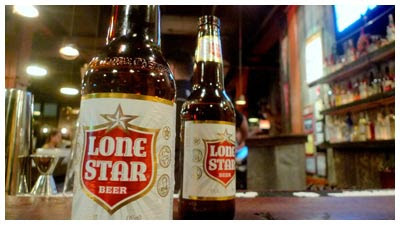 A great place to find a seat is at the bar, where you can grab a bottle of Texas's Lone Star beer ($4) and get a nice overview of the whole place while you eat and drink. Smiles of staff and customers alike will surround you, and as your stomach fills up relentlessly you will already start looking forward to your next visit. It's that type of place. 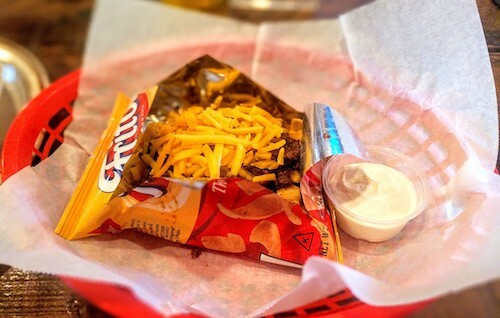 Frito pie, the ultimate late night snack.